If you've "got milk" that came from the soybean rather than a dairy cow, you might want to consider the possible hormonal effects. Soybeans contain substances called isoflavones that possess hormonal activity -- especially on estrogen -- but the jury is still out regarding soy's effects on testosterone. 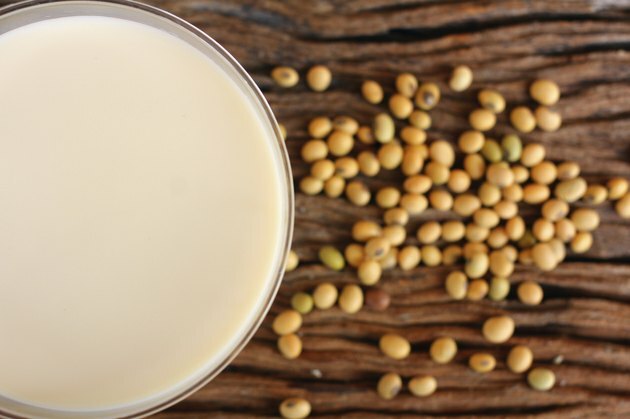 Neither soy protein nor soy isoflavones had any effect on testosterone levels in adult men who consumed soy foods or products, reports an August 2010 article published in "Fertility and Sterility." This article was a meta-analysis, which is a review of many studies on one subject. Since that time, however, two research studies have produced different findings. Men who performed heavy resistance exercises after supplementation with soy protein for 14 days developed decreased serum testosterone, according to a 2013 article published in the "Journal of the American College of Nutrition." Another article reported that when male rats were exposed to soy isoflavones in the first three weeks of life, testosterone production increased, according to findings in the February 2014 article in "Biology of Reproduction."